They can call in their diagnosis using the working CB radio, and then secure their patients for rolling rescue using the stretcher and patient seat! Visit Doc McStuffins Get Better Talking Doc-Mobile Clinic. 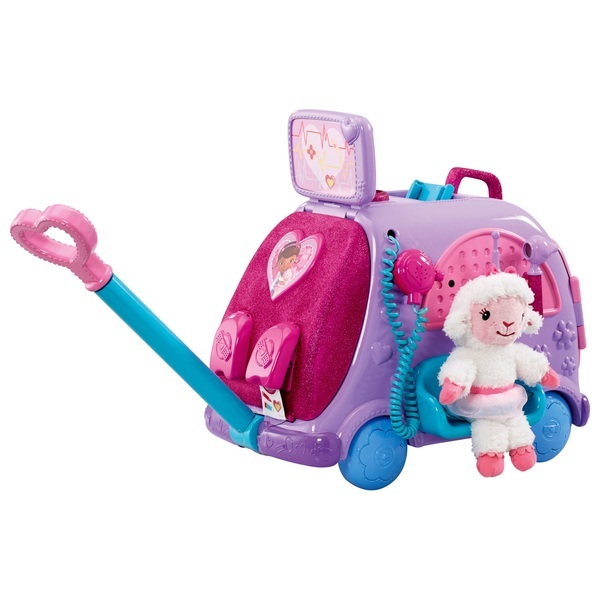 'Doc' McStuffins gets a little help from her stuffed animal friends, Stuffy, Hallie, Lambie and Chilly. It’s just like her dad built for her to first transport Norton on the Disney Juniors popular Doc McStuffins TV Show. The Mobile Clinic gives kids everything they need to provide on the go care.Kids can let friends know they are in a hurry with the motion-activated siren that lights up and plays the Doc Mobile song. The Mobile Clinic contains a light and sound heartmonitor, otoscope and thermometer to check up on the patients vitals. They can call in their diagnosis using the working CB radio, and then secure their patients for rolling rescue using the stretcher and patient seat!